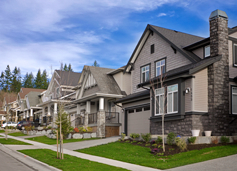 BREEZE RESIDENCE by Gardenia Homes Ltd.
One of the most visible new townhouse developments in the Burke Mountain area is the Breeze Residence - bordering Coast Meridian Road on the east side, just south of David Avenue in Coquitlam. These 2, 3 and 4-bedroom townhouses will be a welcome addition to the area and continues the trend towards higher-density developments in Burke Mountain. The larger floorplans will feature 2.5 bathrooms, a 2-car garage, a kitchen island, a large deck and a walk-in closet in the Master Bedroom. Breeze Residence by Gardenia Homes is now SOLD OUT. 1,500 - 2,016 sq. ft.